Connecticut saw one of the highest increases in the nation in preventable deaths from unintentional injuries from 2010 to 2014, mainly because of a spike in opioid overdoses, according to a new report from the Centers for Disease Control and Prevention (CDC). An analysis of the report shows that the state’s rate of potentially preventable deaths from accidental injuries jumped 97 percent – the sixth- highest increase nationally, after Maryland, Massachusetts, New Jersey, New York and Virginia. Nationally, preventable deaths from accidents – namely, overdoses from prescription and illicit drugs, as well as falls – rose 23 percent. Connecticut had 1,142 unintentional injury deaths in 2014— the second highest in New England, after Massachusetts. About half (568) were accidental drug intoxication deaths, according to the Office of the Chief Medical Examiner. The number of such deaths is expected to surpass 850 in 2016, Chief Medical Examiner Dr. James Gill projected earlier this year. Gill said he was not surprised that the CDC report showed a sharp increase. The CDC report estimated preventable deaths using a formula comparing the number of expected deaths with the number of observed deaths in 2010 and 2014. He said that, unlike the men and women in their 30s and 40s who have historically come in seeking help to quit alcohol and drugs “with their hands up,” heroin users are younger and usually are “chased into treatment” by the courts or family members. “If they make it to 35, they’re enormously lucky,” Malone said. Those whose lives are spared by Narcan (naloxone), an opioid overdose antidote, often go right back to using drugs, he added. Gary Mendell, founder and CEO of Shatterproof, a non-profit organization that advocates for addiction treatment and prevention, praised Gov. Dannel Malloy and state lawmakers for tightening prescription monitoring, expanding access to Narcan, and making other changes to reduce overdose risks. But he said, “There’s no question that more can be done,” and he urged the state to adopt the CDC’s recent recommendations for opioid prescribing for patients with chronic pain. Among the recommendations are that primary care providers treat patients with non-opioid therapy, whenever possible; start patients on the lowest effective dose of opioids; prescribe three days or fewer of opioids for treatment of acute pain; and avoid concurrent prescribing of opioids and benzodiazepines. State adoption of the guidelines “would be a big step to saving lives and reducing the (overdose) number substantially,” Mendell said. Meanwhile, on other causes of death, the CDC report includes some good news for Connecticut. Potentially preventable deaths from heart disease fell 51.6 percent in the state – far more than the national average decrease of 4 percent. Preventable deaths from cancer declined 87 percent – greater than the national drop of 25 percent. Avoidable deaths from stroke in Connecticut fell more than 100 percent — significantly more than the 11 percent drop nationally. Preventable deaths from chronic lower respiratory disease (CLRD) increased slightly, as they did nationally. The CDC report includes national and state-specific death rates for people under the age of 80 for the five leading causes of death, which represented 63 percent of all deaths in 2014. The CDC estimates that 15 percent of those cancer deaths, 30 percent of heart-disease deaths, 43 percent of unintentional-injury deaths, 36 percent of CLRD deaths, and 28 percent of stroke deaths were preventable. The report cites progress in early detection and treatment, as well as a 12-percent decline in the age-adjusted death rate from lung cancer, as key drivers in reducing preventable cancer deaths. Similarly, it credits improvements in care and reductions in risk factors such as hypertension for the decline in death rates from heart disease and stroke. 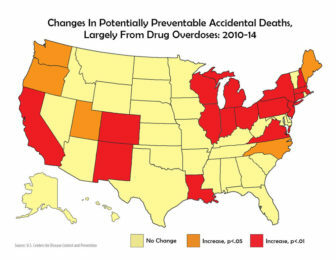 Of the increase in preventable accidental deaths, the report cites efforts in some states to reduce drug overdoses by enhancing prescription drug monitoring programs; increasing access to naloxone; and tightening opioid prescribing guidelines – as Connecticut has done. Connecticut recently was awarded $5 million in federal money to increase access to medication-assisted treatment for opioid addiction and to strengthen prevention efforts. The treatment grant targets states based on rates of treatment admission for heroin and opioids, prioritizing those that have seen the largest recent increases.